APPLE (Accredited Professional Preschool Learning Environment) is a national early learning program accreditation. With over 900 accredited programs and many more engaged in the process, APPLE is ‘Solid to the Core’! In Florida, APPLE is accepted into the State of Florida’s Gold Seal of Quality program. The best benefit is giving your parents the trust that the care of their children is at an APPLE accredited program. 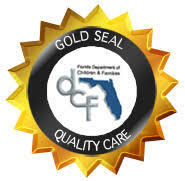 In 1996, the Florida Legislature established the Gold Seal Quality Care program to acknowledge child care facilities and family day care homes that are accredited by nationally recognized agencies and whose standards reflect quality in the level of care and supervision provided to children.